Do your community members like to strike up conversations about library materials they love? Do you wish there was a way to share your students’ and patrons’ enthusiasm for books, movies and music with all the people your library serves? Check out Awesome Box. 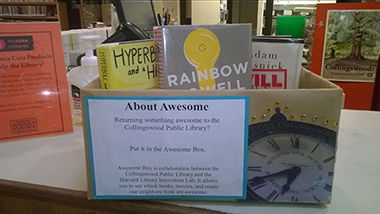 Awesome Box is a collaboration between the Harvard Library Innovation Lab and public, school, and academic libraries. It allows everyone to see which library materials their neighbors, friends, and classmates think are awesome. 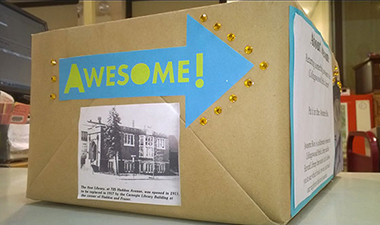 The Awesome Box is a low-maintenance way for libraries to bring an extra element of delight to library visits. There are Awesome Boxes in libraries all over the Garden State (we’ve included a list below). We spoke with Collingswood Public Library’s Head of Access and Technical Services, Carissa Schanely, about her library’s Awesome Box. Q: How did Collingswood get involved with using an Awesome Box? A: Our Director, Brett Bonfield, saw information about it on the Harvard Library Innovation Lab’s website, and approached staff about launching an Awesome Box of our own back in 2013. I really liked the idea, so our team pursued it. The process was very straightforward and easy: we just contacted the Awesome Box team and gave them access to our catalog so people could place holds directly from entries on our Awesome Box site. Q: So how does the Awesome Box work? A: It’s so simple. We have a decorated box out at the Circulation Desk. Patrons put items they loved in the box, I scan them, and they appear on the Awesome Box site for the library. Circulation staff prompt members to add items to the box, too, which fosters positive staff-community interactions and leads to good conversations. Even longtime users love it when they’re reminded of its existence. I use it as a media advisory tool on the circ desk all the time, but I’m not sure if people consult the Awesome Box site for media suggestions. Q: What’s been the public response to the Awesome Box? 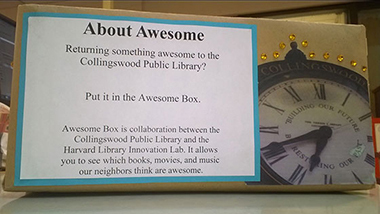 A: The Awesome Box has been a feature at Collingswood for nearly two years, but we find value in re-advertising it, because it always seems new and wonderful to people who haven’t used it before. Delivery to eligible school libraries ends for the summer on June 19 and resumes the week of September 14. Best wishes for a happy & relaxing summer! Our ProQuest offer has been renewed for FY2016. The discount is available to LibraryLinkNJ public and K-12 school library members through June 30, 2016. We also have a new discount on Infobase Learning/Facts on File products. All LibraryLinkNJ members are eligible for savings on Facts on File databases and eLearning modules, as well as ebook packages and streaming media from Access Video, Films on Demand and more. This offer expires December 31, 2015. Webinar: Are You In(novation) or Out? Target Audience: All front-line and administrative staff in all types of libraries. Show me an innovative library and I will show you a healthy organization. Libraries that place trust as the number one staff goal are not only more innovative, but can also boast stellar customer service and a top-notch employee recognition program. When staff do not have to worry about lack of support, in-fighting or surviving a toxic workplace, they can focus on bigger-picture issues, benefiting the entire community. In this webinar with Kalamazoo Public Library’s Head of Branch and IT Services Kevin King, you’ll learn how to apply the secrets of the world’s most innovative organizations to libraries. In this inspirational and informative discussion, participants will gain the tools to move their team and library forward. Implement steps to make your library a place where ideas are openly and honestly shared among all staff. Define the steps to develop a healthy organization that encourages innovation and free thinking at all levels. Foster exceptional customer service and personal recognition throughout your staff. Secure your seat - register today! If you can't participate in real time, we'll be archiving Kevin’s presentation and slides. Please choose the date that is more convenient for you! Mentoring can be critical to the success of any career. A good and effective mentor can help others to meet career goals, as well as motivate and set a good example. This webinar will discuss the importance of mentoring others and ways that you can serve as an effective mentor. Registration for LibraryLinkNJ’s 30 licenses for lynda.com’s vast library of video learning courses opens on the second Tuesday of every month. Full details are available on our lynda.com page. One recently added course that’s piqued our interest is one on Grant Writing for Educators. You can preview the course, which “explains elements of a grant solicitation, the parts of a successful grant application, and common mistakes you'll need to avoid. The good news is, if you are an academic professional at the K through 12, community college, four-year college, or university level, you already have the skills, knowledge, and talent you need to be a successful grant writer.” If grant writing isn’t the right fit for you, perhaps you’d be better served by taking a course on topics as diverse as Excel, podcasting software like Audacity, and version-control software Git. Take a look around and reserve your space on July 14!